NRC inspectors Robert Krsek, Annie Kammerer and Steve Campbell (L to R) conduct seismic walkdowns of the emergency diesel generators at the Kewaunee nuclear power plant. In response to the lessons learned from last year’s nuclear accident in Fukushima, the NRC has required every nuclear power plant in the U.S. to take a number of actions. One of the highest-priority actions involves re-examining earthquake and flooding issues. 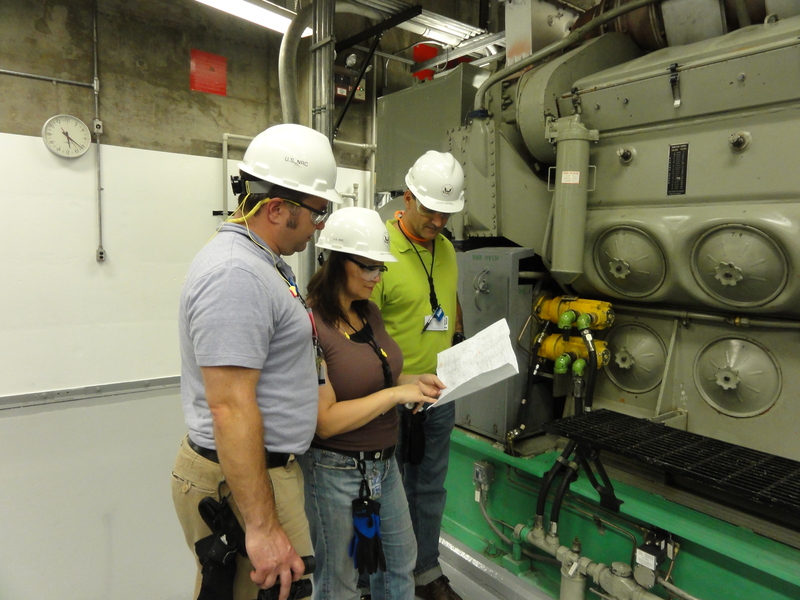 In the short term, both plant personnel and NRC inspectors (shown in the photo) are walking through the plants, ensuring the systems and components can withstand the hazards that were analyzed when the reactors were built. There are separate “walkdowns” for earthquakes and flooding. Before the earthquake walkdowns start, the plants compile a list of reactor and spent fuel pool systems that must work after a quake. The plants also assemble teams of employees, both people familiar with plant systems and mechanical or civil/structural engineers with experience working on nuclear plant earthquake issues. The teams walk through the plant, examining how systems and components are anchored or supported to ride out a quake. They also look for issues such as whether a quake might lead to a fire or cause something to fall on an important component. For the flooding walkdown, the plants compile the features (such as watertight doors or barriers) that protect the site, and take into account any site changes (new buildings, for instance) that could change flooding effects. The plant personnel doing the work would again include engineers in relevant specialties, as well as staff familiar with flood response procedures. As these teams do their work, they’ll ensure the protective features are in place and able to deal with floods. They’ll also examine how much extra physical margin is available beyond what’s expected. For example, consider a watertight door protecting against a flood to the top of the door as called for in the plant design. If a window two feet above the door could allow floodwaters in, the site has two feet of available physical margin. The plants will use their corrective action programs to deal with any issues identified during both walkdowns. The plants must correct any situation that challenges their ability to withstand quakes or floods previously analyzed. The NRC’s part of the walkdowns combines earthquake and flooding specialists from our headquarters with the resident inspectors who work every day at the plants. They will examine the plants’ walkdown documentation and perform independent inspections to ensure the plants have done the walkdowns appropriately. The NRC’s resident inspectors will also follow up on the plants’ actions to address whatever issues they identify. The walkdowns will also provide information for the other part of the earthquake/flooding reanalysis, which will ensure the plants understand the current hazards at every site. This additional work will continue for several years, with flooding work completed by 2015 and earthquake work continuing into 2016 for plants needing the most extensive reanalysis. These walkdowns are just one part of the many actions we’re taking in response to what we’ve learned from the events at Fukushima. More details are available on our website. This discussion should benefit from the ANO case in which the plant was not built right in the first place, the post-fukushima walk downs didn’t work, and the problems were surfaced as a result of the stator drop. Additionally the plants had similar walkdowns as part of the IPEEE program in the 90s. you are right.The protection is needed to nuclear plants. If there is no proper protection it causes reactions like Fukushima. All U.S. plants did a less-detailed version of the walkdowns, on their own initiative, shortly after the events at Fukushima. Those inspections ensured the plants were aware of the issues and were properly prepared for similar events. The NRC issued the formal requirement for the walkdowns in March 2012, and then held several public meetings to ensure the guidance for conducting the detailed walkdowns was complete and coherent. The walkdowns are expected to be complete by early next year. The NRC’s inspection reports on the walkdowns will be posted to the agency’s Japan-related actions page. As we said in the original post, the plants will also be conducting detailed re-analysis of their flooding and earthquake risks over the next several years. These walkdowns, re-analyses and related actions will help ensure the plants can withstand severe natural events, which would prevent the need for any public actions due to events at a plant. A separate set of NRC activities are focused on ensuring existing emergency preparedness activities can be carried out after a severe natural event. In the very unlikely event of a radioactive release from a nuclear power plant accident, the weather conditions at that time would dictate the release’s possible spread. It is not possible to map out releases in advance. Most of the types of features in plants involve submarine style flood doors, airlocks, penetrations, and things which would not really be appropriate for homes. CaptD – there are a vast amount of resources and information available on the NRC website at NRC.gov, including site-specific details on “your” nearby plant. Have you looked there? If you live within the recognized emergency planning zone, then every year you are mailed a copy of the plan, with maps. If you don’t have one, I’m sure your local government emergency response agency can provide one. As for time frames, initial evaluations were already done, and now more detailed ones are in progress. US facilities are better prepared for Loss of All AC contingencies than the Japanese were because of App R requirements implemented after the Browns Ferry fire decades ago, and the B.5.b requirements after 9/11. i wonder how many of these feature they ad to homes that are built in known flood area’s. That might bring the cost of the home insurance or flood insurance down in those areas affected by flooding. 1. Why has this “inspection” not already been done? 2. When will the results be posted, so people can learn about “their” reactors safety? 3. What size natural disasters will “overwhelm” existing safety limits, or better put, what size Quakes and or Floods will put a reactor complex in danger of a Fukushima type Trillion Dollar Eco-Disaster? 4. How will this inspection change or modify the Safety evacuation plans for each reactor complex? 5. Where can people find the Evacuation Plan for every US reactor and do these “Plans” include wind roses that illustrate where Fallout will be directed in case of a radioactive release and or a meltdown “event”? If the NRC will not publish these and other important facts, they are failing to serve the Public!